Whether consciously or not, every artist has their own lexicon of images and visual cues that emerge through their works, though perhaps no one constructed as complex or diverse a visual vocabulary as Jean-Michel Basquiat. With the task of deciphering Basquiat’s pieces having confounded and delighted both critics and collectors alike for decades, it’s important to recognize that contemplating the meanings behind his works isn’t about knowing answers with any degree of certainty; it’s about provoking thoughtful discourse and intellectual excursions, about theorizing intent from another man’s shoes. And it is indeed these shoes that Kidrobot invites one to wear with the issuing of the Jean-Michel Basquiat Dunny Series, the artist’s imagery translated from their original flat surfaces and onto a collection of limited edition sculptural forms, each of the 3-inch tall vinyl pieces begging the viewer to consider where they came from and what they mean. Created on a canvas roughly to scale with his marbled composition notebook’s dimensions, a proportion that has been referred to his Basquiat’s artistic golden ratio, 1988’s Untitled (Ideal) features a brushed field of pale lemon-colored acrylic paint with a stylized rendition of the Ideal Toy Company in black oilstick upon it. Having employed this logo in a number of his later works, it has been suggested that Basquiat’s usage of it conveys the conflict between artistic integrity and commercial success, echoing the “one must sell out to succeed” mantra. Not only supported by the gold-like backdrop upon which it is placed, other instances of this logo’s appearance in Basquiat’s works places an intentional spacing in the word, changing the term for perfection’s pursuit into “I deal”, a wholeheartedly sales-based pitch. Pegasus is an interesting entry in Basquiat’s oeuvre as it wasn’t a work that began with a decided structure but rather one that emerged as he added to it in-between other paintings. In fact, according to gallerist Annina Nosei, Basquiat completed this piece while talking with her, spontaneously filling the upper section with black. Perhaps subconsciously reflective of his own growing feelings of isolation, the emptiness atop this painting also eludes to the mythological winged horse it is named after, a beast birthed from the blood of Medusa’s beheading. And spreading downward from this blackness is an inundation of words and images, their chaotic array negating them as simple expressions and transforming them into a bombastic gestural composition. Amid the thoughts spilling forth from his own head, Basquiat chose to incorporate a variety of diagrams and symbols from Henry Dreyfuss‘ The Symbol Sourcebook, A Comprehensive Guide to International Graphic Symbols, several of which were so-called “hobo signs”, markings placed by homeless people on fence posts, building walls, and railroad equipment to aid one another in finding help or avoiding trouble. Perhaps due to the risque implications of this piece’s title and scrawled statement, Basquiat’s King Pleasure has erroneously been assumed by some to be a proclamation of the artist’s sexual prowess or similar bedroom bragging. From what is known, this piece’s true intent is to pay homage to jazz vocalist Clarence Beeks, who used the stage name King Pleasure and was an early pioneer of vocalese, a style in which written lyrics were sung in accompaniment to previously instrumental tunes. Basquiat’s tribute to this musician is a calm and soothing mustard yellow surface, the vast emptiness drawing attention to the musician’s name and the crown that the artist imparted to him. With several obscured, scribbled out elements adjoining this focal area, their inclusion feels representative of a lyricist working on a song, as if erasing half-thoughts while underlining the parts to be stressed. 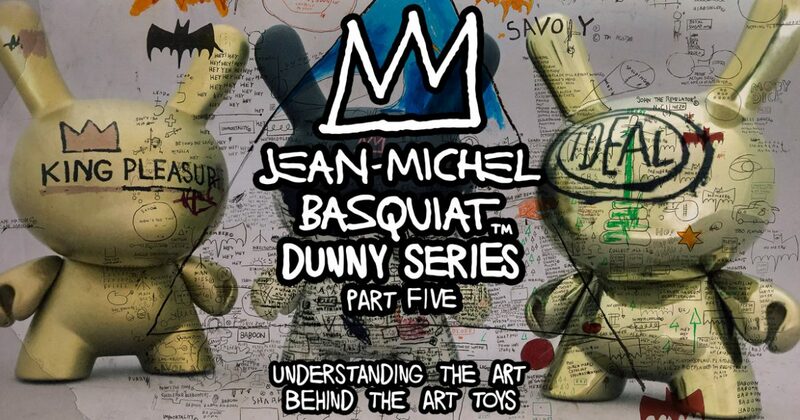 And perhaps that was Basquiat’s ultimate intent, an attempt to explore creativity in a manner akin to that which the musician would have, just as how the Jean-Michel Basquiat Dunny Series may be seen as Kidrobot’s endeavor to explore their Dunny form as this famed artist might have. Click Here to Acquire the Jean-Michel Basquiat Dunny Series from Kidrobot, or Click Here to Find a Kidrobot Retailer to Order it from.